The Omnilight™ FPL is the safest, most cost effective, and most versatile solution for all your medical aesthetic treatments – on all skin types. A true multi-purpose light source for dermatological applications, the Omnilight™ FPL offers state-of-the-art treatment efficacy in combination with unique features to minimize the occurrence of side effects. Using carefully controlled pulse bursts of light to break down skin imperfections, the Omnilight™ FPL allows the body to replace damaged skin cells with healthier, fresher skin. Simply put, whether it is unwanted hair or a vascular or pigmented abnormality caused by sun exposure, age, or genetics, the Omnilight™ FPL improves the appearance of skin by safely and effectively delivering light of the ideal spectrum and dose – all with just one machine. American Medical Bio Care’s patented fluorescent pulsed light (FPL) technology utilizes proprietary laser-dye impregnated polymer filters to convert unwanted energy from a xenon flashlamp into wavelengths that enhance the effectiveness of the intended applications. Because the energy is more efficient, and the amount of heat generated is significantly less than comparative intense pulsed light (IPL) systems, the Omnilight™ FPL system is considerably more reliable, can be built smaller and less expensively, and will work from any wall outlet. 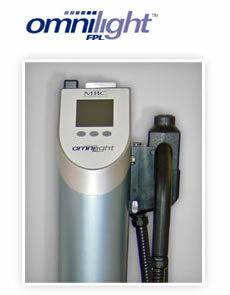 The Omnilight™ FPL is a true multi-purpose treatment system. You can simply change filters and perform a different procedure – such as permanent hair, pigmented lesion reduction, acne treatment*, skin rejuvenation, and vascular lesion treatments. Separate handpieces allow you to perform tattoo removal† and other vascular treatments. To do what we do with just one handpiece, our competitors must use up to six (6) handpieces. Fits in any treatment room. The Omnilight™ FPL offers for each specific application an optimized output spectrum, providing consistent and repeatable clinical results, along with optimized performance. In every aspect, the Omnilight™ FPL should equal or surpass in performance virtually any laser dedicated to specific treatments and will outperform standard IPL systems as well. Copyright © 2006 American Medical Bio Care Inc., All rights reserved.